From 13th – 16th June 2017, BINUS UNIVERSITY hosted the Common Purpose Study Abroad programme in partnership with Harvard University, University of Chicago, and Georgetown University. Common Purpose Study Abroad is an experiential leadership programme that takes students out of their comfort zone and into a new city to develop their Cultural Intelligence (CQ): the ability to cross boundaries and thrive in multiple cultures. The programme focused on the topic of achieving inclusivity through the establishment of ‘smart cities’. 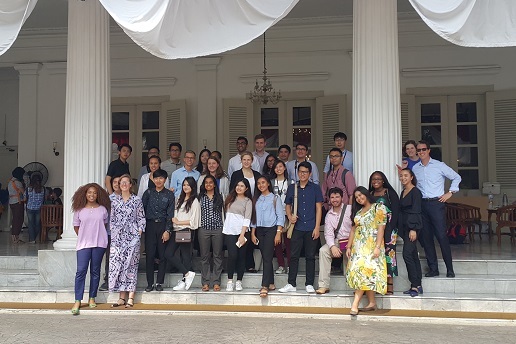 Participants include 15 selected students from BINUS UNIVERSITY as well as 15 students from Harvard University Institute of Politics, University of Chicago Institute of Politics, and Georgetown University Baker Center for Leadership & Governance at the McCourt School of Public Policy. Moreover, a range of guest speakers participated in the event including: Mr Oswar Muadzin Mungkasa, Deputy Governor for Spatial Planning and Environment of the Jakarta Capital City Government; Mr Gufroni Sakaril, President of the Indonesian Disabled People Association, Ms Veronica Colondam, Founder/CEO at YCAB Foundation, Mr Tendy Gunawan, Programme Officer at the International Labour Organisation. In addition, a number of other key representatives from the Jakarta Capital City Government and several private sector representatives also attended the event. Through the programme’s chosen theme, BINUS UNIVERSITY strives to serve as a forum to discuss the opportunities and challenges ahead for Jakarta as the city forges ahead in becoming a smart city in Indonesia. BINUS UNIVERSITY also highlights that the trend towards smart cities is also moving in-line with the global shift where 70% of the world’s population will reside in urban areas by 2050. Participants and guest speakers are, therefore, encouraged to explore the various methods in which citizens, cities, and organisations can cooperate so as to push for economic growth as well as accomplish proper standards of living. As such, the Common Purpose Study Abroad event provides attendees with the resources and facilities that develop global leaders who are equipped with an analytical mind and solutions-driven attitude. In order to realise this goal, BINUS UNIVERSITY and its list of partners have crafted a series of agenda programmes that promote group-oriented and individual-centric thinking. As Jakarta and other cities across the globe forge ahead in becoming a smart city, it is thus essential for industry leaders and higher education institutions to equip future leaders with the mindset as well as the insight that will work towards creating equal opportunities and long-term sustainability.